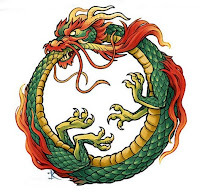 The Gnostic's Yaldabaoth serpent create is similar to Chinese Red Dragon, Japanese Dragon,and other dragon that has a head like lion which dwell on the sea or ocean. In Gnostic cosmology,Yaldabaoth lion-headed serpent which sprangs out from the bottomless water or from the primordial waters that was flush out from Pistis Sophia's womb.The dragon have scaly skins because it breeds and dwells on water like a scaly fish. Almost all religion have dragon or serpent symbol which either represents evil or good. Yaldabaoth is a lion-head serpent who eats his own tail or whose mouth is on his tail.And this depiction is also similar to Ouroborus Dragon.